Do you ever read about food in a book and suddenly get a craving for it? If that has happened to you, then you'll understand why there is a turkey roasting in my oven today. I blame it all on Anna Quindlen's novel Still Life with Bread Crumbs. No, it wasn't the bread crumbs but the description of Thanksgiving. Really, not the main Thanksgiving meal, but the leftovers. The idea of a turkey sandwich, those thick slabs between two slices of wheat bread, are what convinced me to buy a turkey at the grocery store yesterday. I finished Quindlen's novel yesterday, and it made me feel hopeful at the end. Maybe the feeling that remains once you've closed the book is the most important thing. Of course, it also made me feel hungry. How bout it? Have you ever gone in search of food after reading about it in a book? 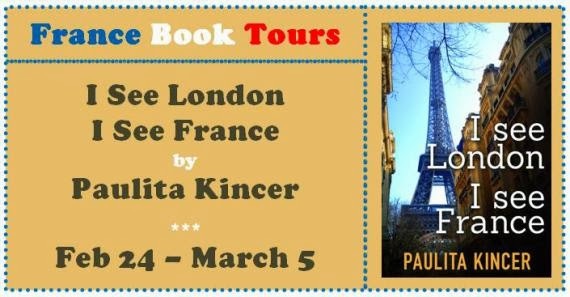 Click on the banner above to go to the France Book Tours website to see another review and enter to win a 10£ Amazon gift card. 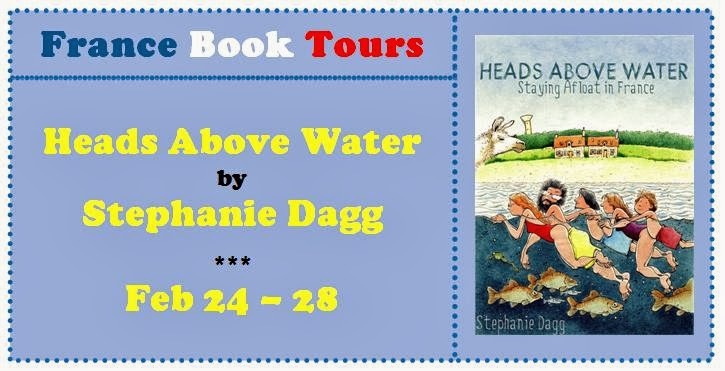 Today I'm reviewing Heads Above Water by Stephanie Dagg. She's another lucky ex-pat who moved her family to France, something I'd love to do, but I'm waiting until the kids are all grown. Stephanie and her husband had been living in Ireland and had three kids, a teenager, an 11-year-old and a 4-year-old, when they bought a ruin of a house in the center of France. Their goal was to run a gîte with fishing lakes where people can catch and release fish, apparently that's a thing. They also added llamas, goats and chickens to their farm. Although I wouldn't imagine farming fish or llamas, I loved the details that Stephanie goes into on how they chose their fish for the pond and how the fish were delivered and transferred. I was breathing hard by the end of all that exertion. The llama purchases were funny as Stephanie and her husband Chris figured out how to keep the four male llamas within their fencing, and inevitably some escaped. One of the highlights of living in central France is watching the birds that migrate in the spring and fall. I loved Stephanie's description of the European Grey cranes flying overhead. We heard them before we saw them. It was a puzzling, whooping sort of noise.... Then sharp-eyed Caiti spotted a thin, grey line in the sky that was making the sound. We watched entranced as it straggled into better view, a higgledy-piggledy arrowhead of large, calling birds. Wave after wave, each one several hundred strong, swept over us during the rest of the afternoon. I can imagine standing there and hearing those birds calling from the sky above. There's lots of French bureaucracy as they try to get permission for all the improvements on the farm. Stephanie is honest about the amount of work involved in trying to accomplish the most minor changes to the farm, but it never seems like France bashing. Their love for their new country and the lifestyle is apparent throughout the book. When you arrive in the morning you can be mobbed by your friends, who you kiss on the cheek or shake hands with, as gender dictates. Then go to locker, grab books and off to class...then to social minefield -- Lunch! So far we've had rabbit, trout, omelettes, steak, mussels and cheeseburgers. Ok, bar possibly the junk food, can many people admit to eating those for school dinner? We're treated like royalty. Even the appetisers and desserts are good. This family definitely is more rugged than I ever hope to be. The house didn't even have a working bathroom. That's a non-starter for me. The minimum requirement will be a working bathroom. That would not quite cut it at my house either. I found the book and the adventure a lot of fun. The amount of work was incredible. I think they must be making a go of the farm now since the author has a blog and writes about her continuing adventures in France. She's also working on a sequel to this memoir, which I'll look forward to reading. I found the writing straight forward and descriptive. She definitely took me on a French adventure. This is perfect for anyone who wants to create their own France homestead, or for those who just enjoy reading about others who do. 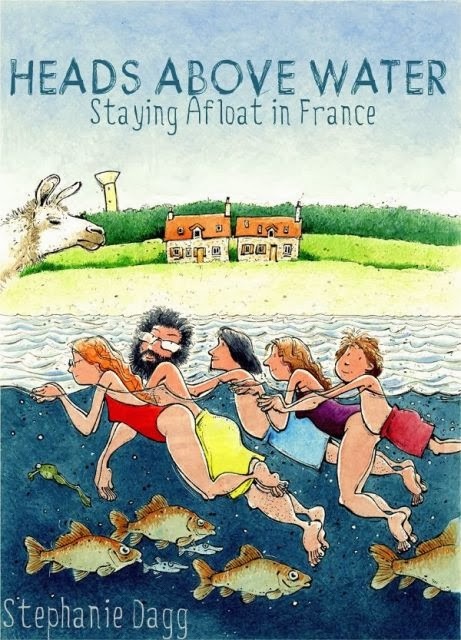 Heads Above Water: Staying Afloat in France is the story of our first couple of years as expats in France. And yes, there are lots of books about living in France out there already. But a lot of these are the short-term adventures of single people or retired couples or tourists. Moving abroad for good with a family and without a pension is a whole new ball game. That’s what makes Heads Above Water different. It’s about us, a family with three children, who stick the hardships out and make things start to work. It’s about actually making a living in a new country and dealing with the sort of rules and regulations that only the French could think of. It’s realistic, honest and gritty – but also fun, lively and very entertaining, and, I hope, ultimately inspiring. I’m Stephanie Dagg, married to Chris for 27 years and mum to Benj (22), Caiti (19) and Ruadhri (12). We live on a 75 acre farm in rural Creuse with llamas, alpacas, pigs, sheep, poultry and three lakes full of carp. 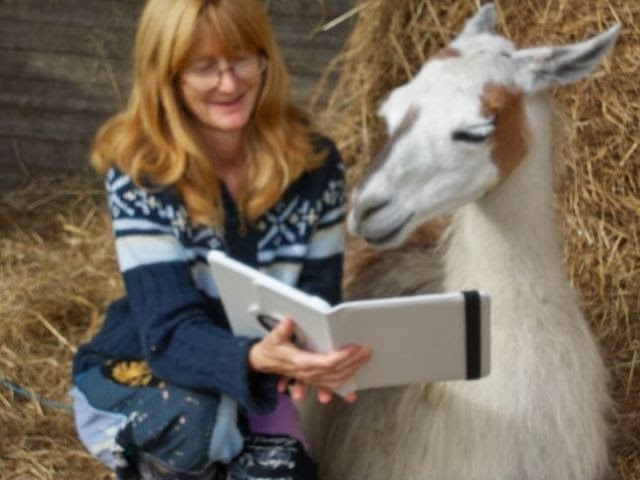 We run a fishery and gite, and also a llama trekking business. We moved here in 2006 from Ireland, where we’d lived for 15 years. Before that we lived in England. 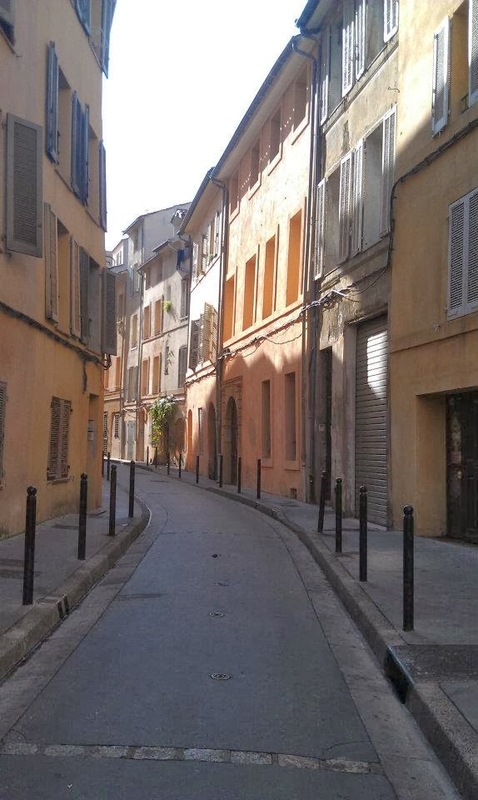 You can follow our French adventures athttp://www.bloginfrance.com. I’m an English graduate (Somerville College, Oxford) and Publishing Studies postgraduate (Stirling). I began a career in publishing in 1985 as a desk editor with Hodder and Stoughton, then I deviated from the path to become a sales rep for a couple of years for some academic presses and then an accountant. This is what meeting and marrying a guy who has a job in Newcastle does for you! Anyway, in 1992 I got back on track by becoming a freelance editor and indexer, working from home part-time around the kids. The same year we moved to Ireland. I began to write stories for Benj, and then Caiti, and I won second prize in a contest in a magazine with one of my tales. That prompted me to begin contacting publishers. I got plenty of rejections but finally hit the right place at the right time with Mentor Press and O’Brien Press in Ireland in 1998. For the next eight years I wrote prolifically and spent many happy hours visiting schools and libraries to do workshops with kids. Then we moved to France and I stopped writing for a while due to sheer exhaustion! Renovating a 200 year old farm that is falling apart takes a lot of effort, and so does running two businesses (running a holiday cottage and fishing lakes, and freelance editing). Life is interesting and full of challenges and we’re so glad we took the plunge and moved to France. If you get a chance, I hope you'll stop by some of the blogs posting reviews of my latest novel I See London I See France. Isn't it nice to read complimentary things about yourself? So far, so good. Though I know not everyone likes the same kinds of books. So far my book has been kindly reviewed on three websites. Words and Peace by Emma said, "VERDICT: If you like travel (Ah, Paris! Provence! ), family issues, strong women trying to find their real place in life, and a touch of romance, don’t hesitate a second, this book is right for you!" 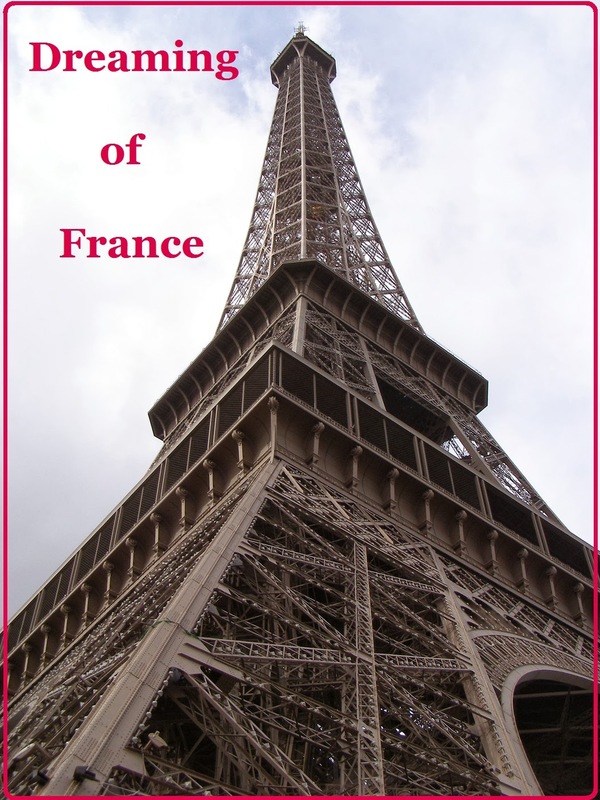 Next at Blog in France, Stephanie said, "The novel is absorbing, beautifully written and fabulously enjoyable. It also offers us a gentle reminder that relationships need working at.... Teenage first crazy love is contrasted with married love and life, temptation with loyalty, self-indulgence with duty. There’s comedy, sadness, romance, bitterness, temptation, discipline – Paulita Kincer keeps us gripped." Then Wednesday, Jacqui on French Village Diaries wrote, "Paulita’s writing went straight to my head; I felt every emotion Caroline was feeling, so much so this book affected my mood even when I wasn’t reading it. This book has a great story line, moved along at a nice pace and with some added interest as it jumped back and forward from the present to her time in Aix en Provence as a nanny in the late 1990’s. This is a book I will read again and I hope Paulita is busy working on her next novel." The tour continues tomorrow. I could read positive reviews all day, still, before every review, I brace myself just in case. The day after my birthday, I received two birthday cards in the mail from friends here in town. There's a theme to the cards. First this one from Deb. She knows me so well. Yes, Paris. 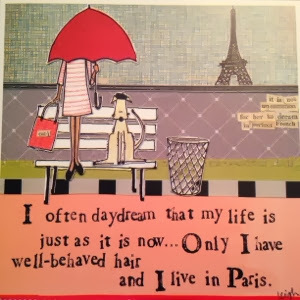 And, yes, my hair would have to be well-behaved, which it never is in France because I don't have a French-compatible hairdryer or straightener. The next card was from my running friend Noreen. You remember her. She had breast cancer a few years ago and ran our running group into the ground proving that she was healthier than us. And she is! Here's the card she sent. Inside it says, "Oh yeah, like if you had magic shoes, you'd go to Kansas." I thought that was hilarious. I'm clicking my heels and feeling better today. Then Tuesday evening, I heard the UPS truck pull up and slide a package across the porch. I wasn't expecting anything, but Earl went to retrieve it. 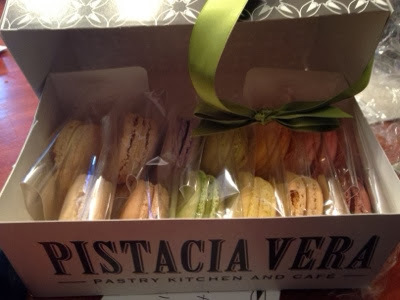 A box of macarons from Pistacia Vera, a terrific bakery in German Village here in Columbus. My running friend Pam, who moved away, sent the macarons. There are flavors of pistachio, vanilla bean, lemon, strawberry, mocha... Too many to name. This afternoon, I was kind of wallowing in my flu symptoms after I had to stop taking the Tamiflu because of a reaction. My face swelled and the skin around my eyes got pink, dry and itchy. As soon as I stopped taking the Tamiflu, my headache and coughing came back full force. I had some errands to run that I couldn't get out of, and while thinking how bad I felt, a song came on that helped me change my attitude. I've made it my ringtone now. I came home, did laundry, cleaned the kitchen, and cooked chicken breast which I made into a delicious chicken salad with sliced grapes and apples and served on croissants. Now I'm going to have a glass of wine and relax, knowing I'll feel cheerier every time my phone rings. One good thing about being sick is the chance to sit and read. 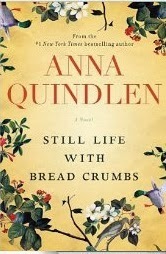 I started Still Life with Bread Crumbs by Anna Quindlen. Here's the intro. A few minutes after two in the morning Rebecca Winter woke to the sound of a gunshot and sat up in bed. Well, to be completely accurate, she had no idea what time it was. When she had moved into the ramshackle cottage in a hollow halfway up the mountain, it had taken her two days to realize that there was a worrisome soft spot in the kitchen floor, a loose step out to the backyard, and not one electrical outlet in the entire bedroom. She stood, turning in a circle, her old alarm clock in her hand trailing its useless tail of a cord, as though, like some magic spell, a few rotations and some muttered curses would lead to a place to plug it in. Like much of what constituted Rebecca's life at that moment, the clock had been with her far past the time when it was current or useful. me with Quindlen's warm writing style. This is the story of a photographer who had one of those famous pictures in the 1970s-80s that people made into posters and hung in their dorm rooms. Now the money from that picture has dried up, she's trying to pay for her mother's nursing home and her father's apartment, so she sublets her fabulous New York apartment and takes a rundown cottage in the country to try to make ends meet. Sunday was my birthday, but since I'm still feeling strung out by the flu, I decided to watch a French movie, Amours & Turbulences, (Love is in the Air). The movie, starring Ludivine Sagnier as Julie and Nicolas Bedos as Antoine, begins in New York as both prepare to catch a plane to Paris. As fate would have it, the ex-lovers are seated next to each other on the flight. I was afraid the entire film would take place on the plane and we'd miss the ambiance of Paris, but as the two remember their relationship and their break up, plenty of Paris scenery fills the screen. As the board the plane, three years after their breakup, Antoine is a player who can't get it up after two weeks with a woman. Julie is a sculptor and takes herself very seriously. Julie is going back to Paris for her wedding in a few days. 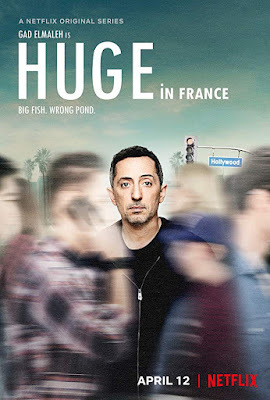 This movie, with English subtitles, was lighter than most French movies are. At my house, we joke that a French comedy only has two or three people die. They are usually very dark. This one is more American-style romantic comedy, which I enjoyed. It wasn't black and white, though, like many American movies are. There were definitely nuances. When Julie meets Antoine at a party and ends up sharing a cab with him so he can escape another woman, they have their first date on the lower observation deck of the Eiffel Tower. As they drink champagne and dance, Antoine counts down then they both look up and see the Eiffel Tower sparkling above them. 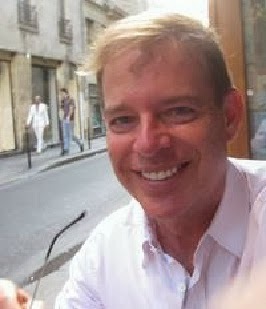 Julie calls Antoine corny for taking dates to the Eiffel Tower or traditional French restaurants where tourists go, but as a tourist, it's fun to travel to these places with the couple. This was a charming way to spend a Sunday afternoon. I highly recommend it. I'm claiming a birthday do over. If you've ever been around elementary-aged kids, a "do over" means you get to do it again. I think a birthday doesn't really count if I don't get to start it with a run. I tried to go for a run, but I was up several times during the night coughing, and I knew it was a bad idea to try to run. Almost as soon as I started to run, I felt that itching, tightness in my throat at the top of my chest. I thought I would walk instead, but since I felt light headed, I turned around and headed back home. I made myself a cappuccino and watched the episode of About a Boy that I recorded from Saturday night. Tonight is the swim banquet, which I can't miss because it is Tucker's senior year and he'll get a bunch of awards. We have planned to go out for lunch or brunch somewhere, even though I'm not really hungry and can't land on a place to think, "that sounds delicious!" But, we're going to pick up Grace and go out for a meal the four of us. I think I'll declare Thursday as my birthday do over. By then, I should be well enough to go for a run. Then I'll schedule a facial with the birthday money from my wonderful parents. So today's my official birthday, but I plan to celebrate later in the week. Can you all stand another post about high school swimming? At least you can know that the topic will soon be put to rest. 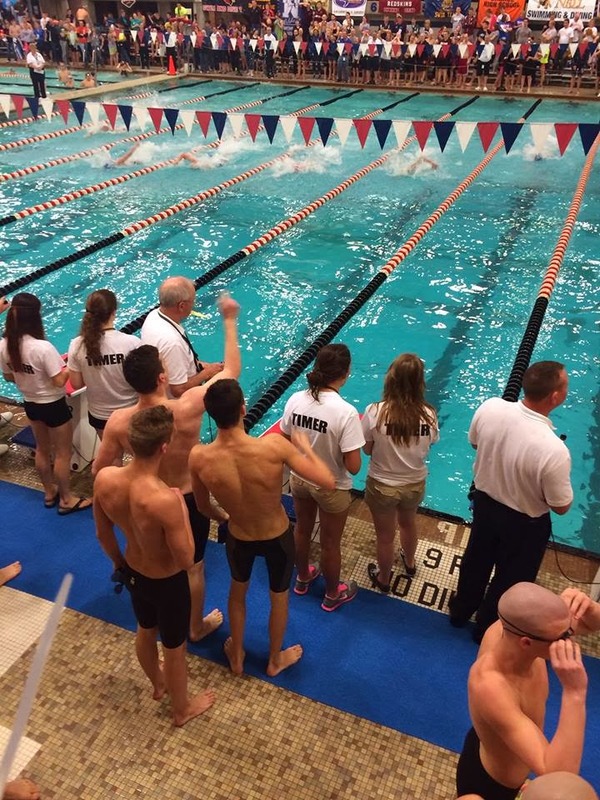 But, after the competition at States on Thursday, the boys relay made it into the finals on Friday night. Tucker was number 17 in the 50 free, so that means he is an alternate in the finals. Just saying this makes it seem like the swim meet was fairly calm. Tucker swam the 50 free as his first event. His time wasn't as good as it was last week, before he got the flu. Within a few minutes, I had a text message from the swim coach. Tucker wanted to "declare a false start" rather than swim the 100 free. Earl immediately felt he needed to swim it. That seemed to be what most of the dads around us said. 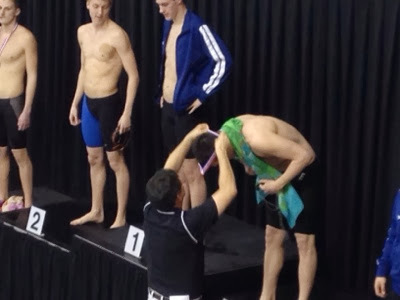 He had made it into States in the 100 free, he shouldn't miss the opportunity. But the flu has a big impact on the lungs, and after swimming the 50 free in 22 seconds, Tucker felt his limitations. He told the coach that he wanted to save his energy for the relay, which had a good chance to make it to the finals. So the coach was able to pull Tucker out of the 100 free, and when that event swam a few minutes later, an empty lane at the end of the pool showed where Tucker should have been. 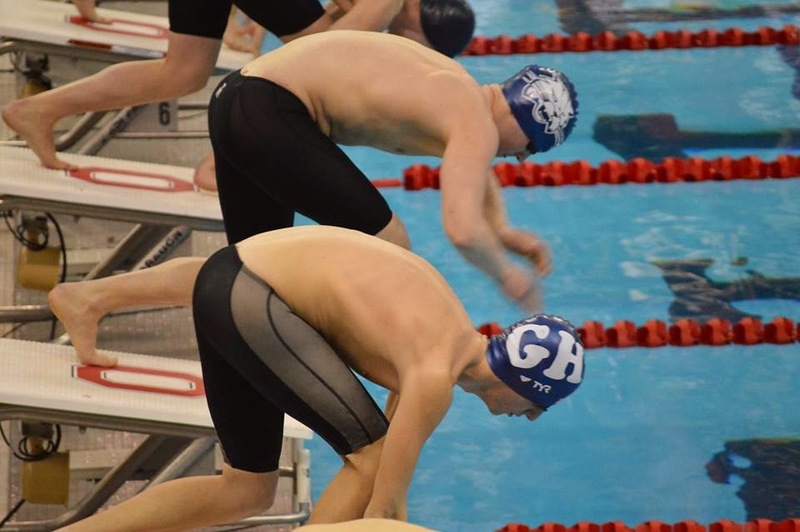 When the 200 relay swam, they placed 15th which put them in the finals Friday night. I recorded the race on my sister-in-law's iPad. My favorite part is before the race starts when Tucker puts his hand on a teammates shoulder and gives him some words of wisdom. Here they are cheering on their final teammate Josh as he swims. 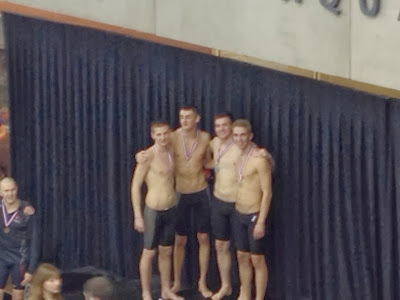 We knew Tucker had one more event to swim -- the 400 free relay, in which each boy swims a 100. I thought that Tucker might let the extra boy on the team swim his leg of the race, but when that boy came up to the stands, I realized Tucker was going to swim it. The boys finished 22nd in the 400 relay, so they won't move on to the finals. One of the teammates, Tucker's best friend Josh, was disgusted with the way he swam and walked away at the end of the race, but I got a picture of the remaining three swimmers. We thought we were finished for the day, but Tucker had tied with another swimmer in the 50 free. He had to have a swim off. I thought he might just concede so he didn't have to swim again. But he decided to get competitive. Sucked up his energy and swam against another boy who had the exact same time. Tucker won. I think that puts him in 17th place. So he won't swim the 50 free in finals unless someone else doesn't swim. So for today, back to Canton, Ohio. That's about a two-and-a-half-hour drive. Earl can't go today, so unless I can convince Grace to come along, I'll be on my own or catch a ride with other parents. 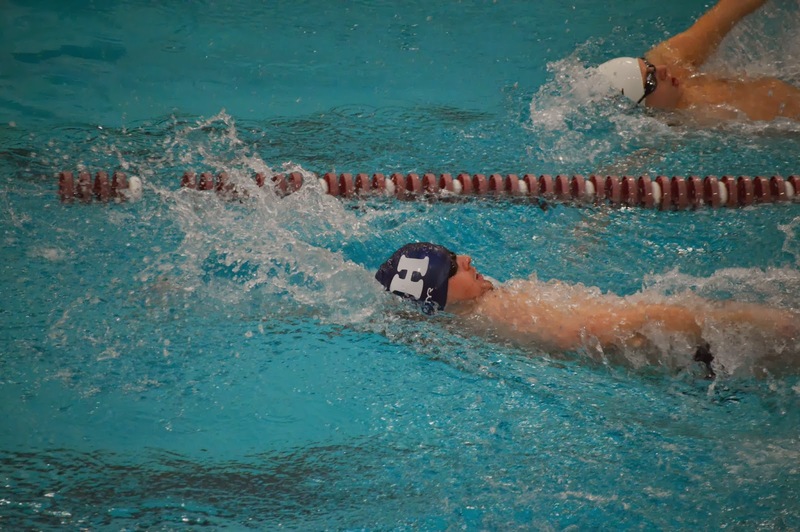 So, on Saturday, I posted about Tucker's amazing day at swim districts. We later found out that he made it to state competition (which we call States) in all four of his events. So, in addition to the 200 relay and the 400 relay, he will swim the 50 freestyle and the 100 freestyle. He's the first individual swimmer to make States in our school since 1952. That's a long time! Of course, I was happy, thrilled, over the moon. 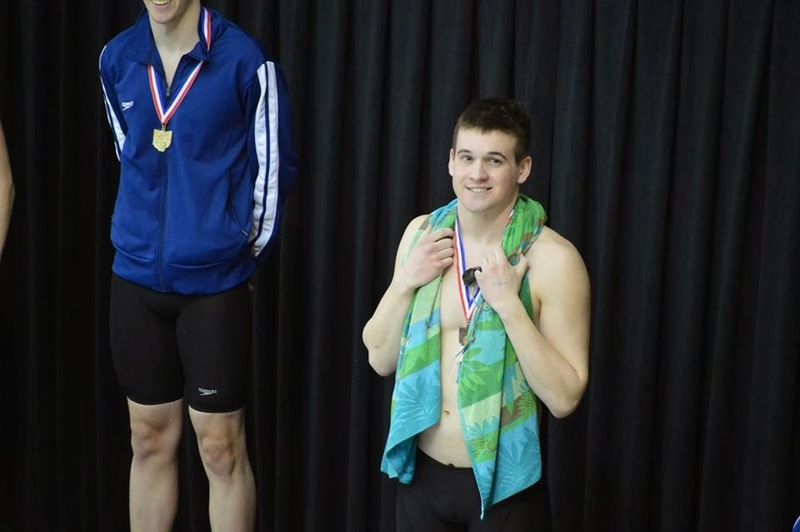 But, at the same time, I was sad because none of the other boys made it in an individual event, including Tucker's best friend Josh, who finished just behind him in the 50 free. I wanted Josh to succeed too, not just for their friendship but for my friendship with his parents too. It's just kind of awkward because I can't be too happy for Tucker or I risk offending parents whose boys didn't do as well. It's a fine line. Here are Tucker and Josh swimming the 50 free next to each other. So, I was already feeling bittersweet about the results, on Sunday, when Tucker started to feeling ill. He coughed, he sniffled, he got chills. He said he felt better, and he went over to Josh's house for a while. Then he came home to take some medicine after he took a turn for the worse. "Let's take your temperature," I said. I warned the swim coach that Tucker had a fever and that he would not be at swim practice the next morning if the temperature remained. The Advil must have brought his temperature down when I took it and let him go to practice. I was in the middle of teaching class when the swim coach called. "I threw him out of the pool," she said. "He looks awful." He did look kind of gray. I asked Earl to make a doctor appointment for him and the nurse practitioner did a flu test and a strep test. Tucker came back positive for Type A Influenza. Today he is home from school, lying on the couch with bizarre Olympic events playing before his uninterested eyes. He is too sick to play video games. We started him on Tamiflu yesterday and hope that he will soon rally. He's supposed to leave for States on Wednesday after school, if he makes it to school. And, I haven't even mentioned the high school musical, which is adding to his stress. He has the male lead. He will miss rehearsal the entire week because of his flu and being gone for States. So, I'm happy and proud of Tucker for his successes. But the arrival of the flu has thrown a wrench into everything. I chose this book because I loved the cover, so whoever says "you can't judge a book by it's cover" may be right (I'll let you know) but you can certainly pick books based on their covers. 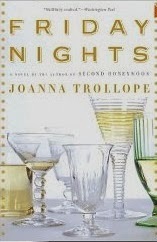 Friday Nights by Joanna Trollope says a group of six women, ages 22 to retired, spend every Friday night together with a bottle of wine and without children or husbands. Then one of them meets a man who tests the group's bonds. Toby's mother said that when Eleanor came he'd have to go down to the ground floor and help her with the lift. Toby said -- sulkily, because he was angry with her for something he couldn't quite put his finger on -- "She doesn't need help." Also this week is Teaser Tuesdays. Teaser Tuesdays is a weekly bookish meme, hosted by MizB of Should Be Reading. Anyone can play along! Open to a random page of your current read and share a teaser sentence from somewhere on that page. BE CAREFUL NOT TO INCLUDE SPOILERS! Share the title & author, too, so that other TT participants can add the book to their TBR Lists if they like your teaser. "Kay, babe, we've had this conversation." He bent and picked up the portfolio. He said, "You used to believe in me." Hope you all are reading something interesting. I'm ready for some sunshine, and what could be better than sunshine in France. Here's a picture from the Atlantic coast. Hope you have some sunny moments today. 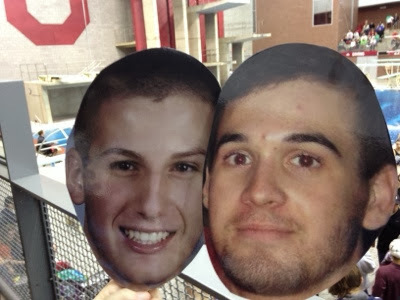 At the District swim meet yesterday, we held up "big head" pictures of our senior kids to cheer them on. Tucker and his best friend Josh are having their graduation party together. I think we should mail these big heads around the world to have people take pictures of Tucker and Josh at different locations. Here's the relay team on the podium with their silver medals. I couldn't get Tucker to bite his medal like they do on the Olympics. Tucker also won a 3rd place medal for the 50 freestyle and a 5th place medal for 100 freestyle, breaking the school record by 2 seconds, which is a lot in swimming time. We are waiting for one more district meet to post times to see if Tucker will swim at States in an individual event. Hope you all are having energetic days too, or at least cozy ones. Let me know if you live some place exotic and want me to send you the big heads for pictures! Lol. Having a terrific time at swim districts this afternoon. The last time for this swim meet. We'll know tomorrow whether Tucker makes it to the States meet. Why didn't I take pictures today? I went to work on costumes for the high school musical. The kids are doing Kiss Me Kate. Tucker is Fred, although I haven't seen the movie or play, so really don't know what that means. Today, Jenny, the woman in charge of costumes, told me to find hats. They need 1940s hats and Shakespearean hats. Apparently the actors in Kiss Me Kate are performing The Taming of the Shrew, a play within a play. Jenny searched for images of Shakespearean hats to show me. Mostly, I thought they looked like throw pillows on people's heads. Here's an example. Then I had to decide whether to search through the throw pillow box or the hat box. I could take throw pillows, add feathers and cut holes in the bottom of pillows so they fit on the kids' heads. 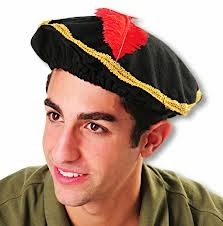 Truthfully, a beret with some tissue paper pushed into the corners and some gold braid along the edge would work too and might be a little easier. Letting me loose in a room with bins full of hats might have been her first mistake. Within minutes I was back out in the hallway modeling hats. Sometimes, when you see a hat, you just have to put it on. 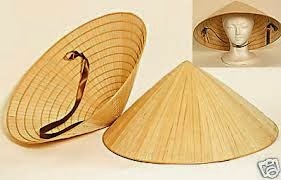 This bamboo hat was awesome, but I couldn't convince Jenny that it would work. 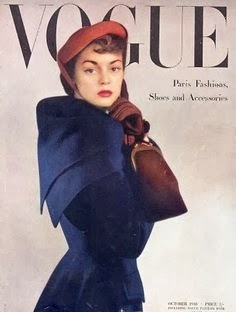 Although she later found a woman's hat from the 1940s with the same shape and covered with fabric. So we might make it work yet. Jenny threatened to take the job away from me if I didn't get serious. So I went back and started sorting through hats. I found a lovely olive green beret. I put it on and began to sing "La Vie en Rose." I continued to paw through fedoras and driving caps when I heard Jenny call me from out in the hallway. I hurried out there again, forgetting about the beret. Jenny and her son, Eli, started to laugh. "Every time you come out you have a different hat on," Eli said. Isn't that the point of finding hats? A hat can definitely transform you. We also pulled some fancy women's hats for the 1940s. Hats similar to this. I also found a hat that had a scarf attached that ties under the woman's chin. Jenny threatened to remove the scarf part but I protested. Someone else in the group reminded us that the Baroness from The Sound of Music had worn a hat like that. I carried the pile of hats into the hallway for Jenny to approve or discard. Then she called a meeting of the wardrobe crew and everyone put on a hat as we discussed what needed to be accomplished to complete the costumes in three weeks. At one point the music director walked into the hallway and started laughing. We all looked at him puzzled then he pointed out the hats. 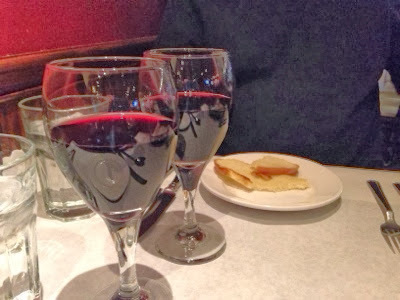 My husband and I may not get a chance to spend any time together on Valentine's Day, so tonight I picked him up from work and we went in search of a restaurant. Who expected restaurants to be packed on a Wednesday evening? I guess it's a good sign for the economy that we couldn't find parking at the Irish place Brazenhead, and at the next place, the valet parking was blocking the road because it was so packed. We ended up at our old standby, Roma Trattoria. 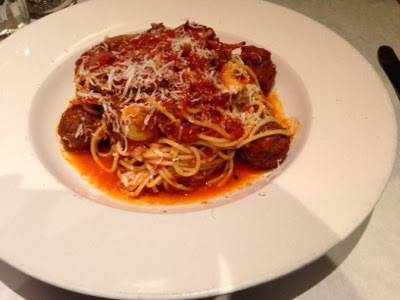 I had spaghetti and meatballs. And we both enjoyed a glass of wine. Mine was a Malbec from Argentina. Very smooth. Hope everyone feels loved on Valentine's Day and every day. 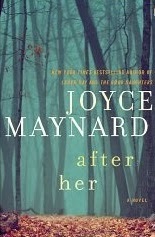 Here's the intro from After Her by Joyce Maynard. The town where my sister and I grew up lay in the shadow of Mount Tamalpais, not far north of San Francisco. The aging housing development where we lived, on Morning Glory Court, sat just off an exit of Highway 101, eight miles north of the Golden Gate Bridge. Buses ran from where we lived to San Francisco -- the bridge marking the entrance to that other world, though we also knew people came there to jump. But for us, the city might as well have been the moon. A little over thirty years ago, on a June day just before sunset -- alone on a mountain in Marin County, California -- a man came toward me with a length of piano wire stretched between his hands, and the intention of ending my days. I was fourteen years old,, and many others had already died at this hands. This is my last year sitting through swim meets. Tucker is a senior in high school and he has already decided that he doesn't want to swim in college, so the feelings are a little bittersweet. Yes, swim meets are long and warm, but I'm so grateful that they aren't outside in the cold. Tucker swam at sectionals on Saturday and won each of his events. The beard on his face was thick and, of course, he hasn't shaved the rest of his body yet. Now he goes on to Districts. Every year he has shaved his head for districts but he and the other guys decided this year not to shave their heads. They don't want to be bald for prom and graduation, even though their hair would have grown back some. And Tucker doesn't want to have to wear a wig for the high school musical a few weeks after swim season. If he finishes in the top two at Districts, he'll go on to States the following week. Earl has to work on Friday, so I'll be the only one in the stands to cheer on Tucker in what might be his final high school swim. Dreaming of France -- Where Would You Live? 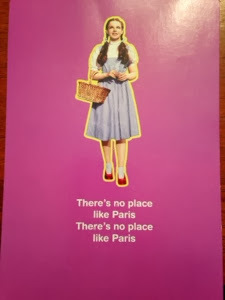 Lately, my husband and I have spent a lot of time talking about where we want to live when we move to France. Maybe it's because our youngest is a senior in high school so we will soon have more living options. We also watch HGTV's House Hunters International to see what other people pick. Our dream is a house somewhere in the south of France, possibly Provence, near a village where we could walk to buy bread or have a drink. Maybe this would be our view from above a city. But if we lived in a city, we'd want to live in an authentic French building, not a large, modern apartment building. Maybe someday we'll have a view like this from our apartment in Aix. Or maybe we'll look out on a square with a fountain, like this one. 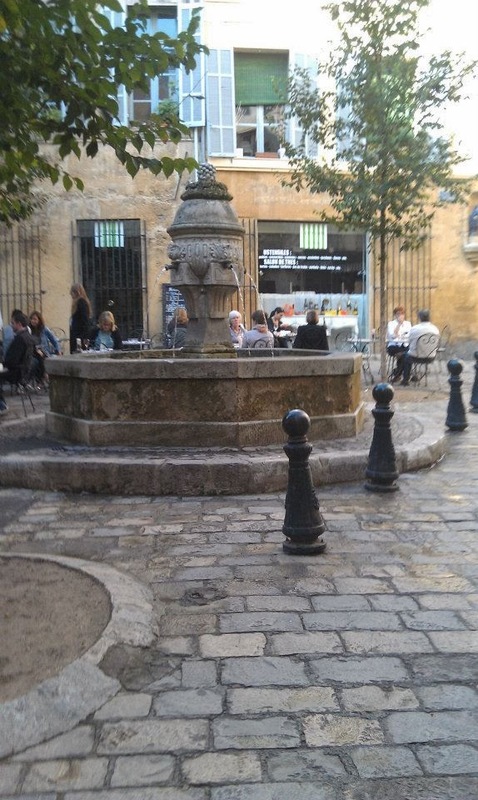 Another photo by Grace in Aix. Yesterday the cat whined to go outside, so Tucker took him out to walk on top of the snow. 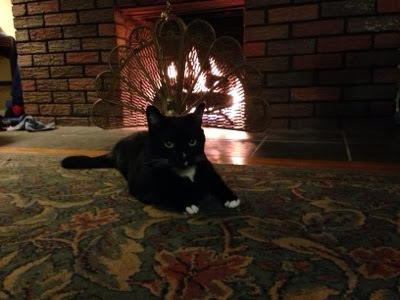 For the first time ever, he voluntarily ran back to the door to come inside. 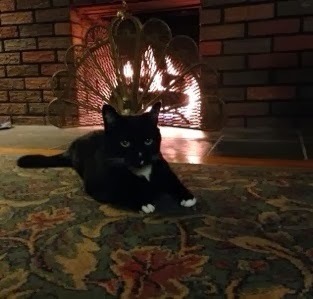 That's probably why he was content to laze in front of the fire last night. Hope you're having a cozy day too. Look what I found at Trader Joe's today. 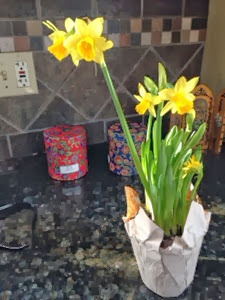 My own, personal sign of spring. 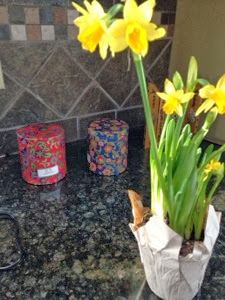 I so needed something sunny to sit on my counter as a counter action to the relentless snow and cold. Spring has to be close, right? 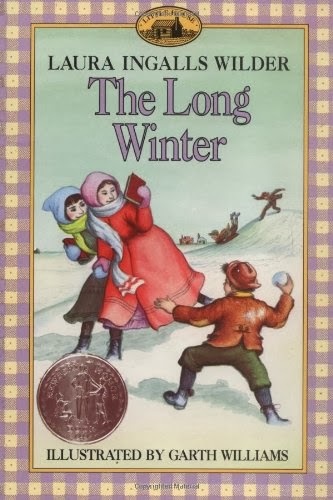 If I were an elementary school teacher, I would definitely have a time period each afternoon where the kids put their heads down on their desks and listened to me read to them from Laura Ingalls Wilder's The Long Winter. Did your teachers ever do that? I have such a warm feeling inside when I remember a teacher taking the time to read aloud to us each day. The book, The Long Winter, is so apropos for this year. It tells the story of Laura and her family on the Dakota frontier during a series of blizzards as food and fuel ran short. Here in Ohio, we've had more snow fall that stayed on the ground, beginning in November than ever before. We've had the coldest weather I can remember, with temperatures dipping down to -17 degrees, and that a straight thermometer reading, not counting the wind chill. On Tuesday night through Wednesday morning, we had a big snow. Even with our increased snowfall, we usually stop after three inches or so. The other night, the snowfall must have been six to eight inches with a nice crust of ice on top. I went out to shovel the snow, since my classes were cancelled and Earl still had to go to work. 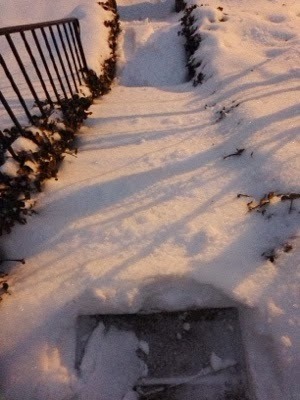 The snow was deep enough along the front steps that it looked like a giant ski jump rather than a set of stairs. Underneath the ice, the snow was heavy and wet. So perfect for a snowball fight or building a snow fort or snowman. But I had no one to play with in the snow. The temperature was pretty perfect too, about 28 degrees. I had on layers, but didn't wear a winter coat. By the time I finished, my thick sweater and knit cap were wet from the snow that continued to drift down. I cleared our sidewalk and the neighbors on either side. Then I went over to another neighbors house; she's in her late 70s and I knew she'd be out to try to shovel. The heavy wet snow was not anything she should tackle. As I shoveled my way up to her door, I saw another woman trying to clear out her driveway where the snow plows had pushed the snow from the road. The snow pile was up to my waist. We worked on that for awhile until she was able to get her car through. I had one more neighbor to help before I could abandon my shovel. Earl walked past on his way to wait for the bus. Since the county had declared a Level Two snow emergency, the bus would be free. He waited for nearly an hour before he came home for the car and gave a ride to several of his companions waiting for the bus. Our little city does pretty well at clearing the roads, and good thing because today the temperature plummeted down into single digits and it's supposed to be even colder. I received this ebook version of the book in return for a fair review. Who knew that Marie Antoinette's hairdresser played a crucial role in her life? greatness. If this was fiction, an editor would argue that Léonard catapulted to success too easily. 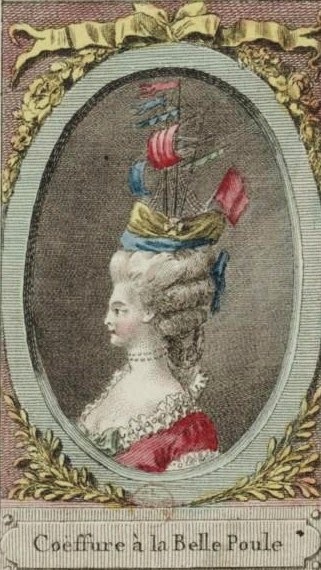 Surely in fiction we would have to make our characters struggle a little harder, but apparently creating outrageous hairstyles on actresses brought Léonard to the attention of the aristocracy. In just a few short steps, he was the hairdresser to the new dauphine, Marie Antoinette. I'll have to say that the initial pages of information in this book had me a little worried. The cast of historical characters was sooooo long. And, since I'm not a French Revolution buff, the characters did get confusing at some parts. I think my daughter, who reads a lot of historical fiction, would have had an easier time keeping all of the people straight. all the outrageous hairstyles created by Léonard and learning about the court intrigue. My favorite was the one that looked like a ship sculpted into the woman's hair. The coiffure a la Belle-Poule consisted of a ship sailing on a sea of thick, wavy hair. It was invented after the naval battle in which the frigate La Belle Poule was victorious. The ship itself, with its masts, rigging, and guns, was imitated in miniature in the pouf. 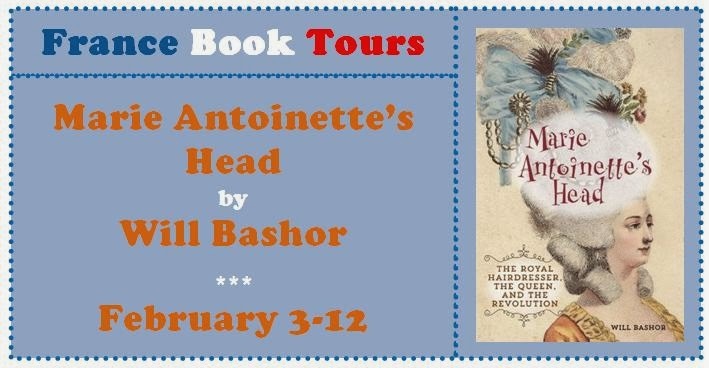 As I read this book, I found it hard to believe that a mere hairdresser could play such an important role for a queen, but the carefully documented sources definitely support Bashor's story. There were times when the story moved slowly, but overall it was entertaining and informative. Marie Antoinette has remained atop the popular cultural landscape for centuries for the daring in style and fashion that she brought to 18th century France. For the better part of the queen’s reign, one man was entrusted with the sole responsibility of ensuring that her coiffure was at its most ostentatious best. Who was this minister of fashion who wielded such tremendous influence over the queen’s affairs? 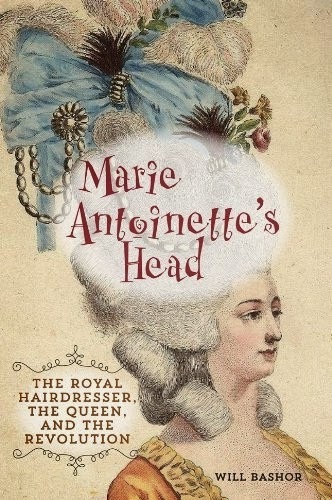 MarieAntoinette’s Head: The Royal Hairdresser, The Queen, and the Revolution charts the rise of Leonard Autié from humble origins as a country barber in the south of France to the inventor of the Pouf and premier hairdresser to Queen Marie-Antoinette. Next week I get to review my favorite kind of French book -- a memoir about someone moving to France. It's called Heads Above Water and is by Stephanie Dagg. We arrived in Ireland in 1992, when times were good, cars were held together by string, and food prices were almost non-existent. Having only ever lived in cramped housing estates in England with tiny gardens and too many neighbours, we couldn't believe our luck at finding a bungalow in the countryside to rent. We called it Harry's House, after our amiable landlord. He didn't put the rent up in over three years, and on the rare occasions we had a building-related problem, he was at the front door to sort it out within minutes. Harry's House had a large back garden and a fantastic view over nearby fields and distant Cork city. It was in a row of five other bungalows all housing lovely families. Fairies first. According to this version, fairies used to bathe in hot springs near these rocks. The Fairy Queen was quite happy with this, so long as the fairies got home before dark. But of course, one day they didn't and the Queen got cross. Sunday was Groundhog Day here in the United States. I guess it is no coincidence that it falls half way between Winter Solstice and Spring Equinox. I didn't even realize that until some of my British blogging friends in France pointed out that it was Candlemas, the halfway mark. Then I realized why Feb. 2 was Groundhog Day. Of course, Groundhog Day was made famous by the Bill Murray movie Groundhog Day. 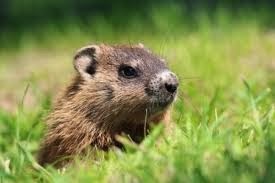 The folklore about Groundhog Day is that the groundhog climbs from the hole where he hibernates to check out the weather. If he sees his shadow, he gets scared and goes back into his burrow for six more weeks of winter. If he doesn't see his shadow, then he doesn't retreat and that is a sign of an early spring. 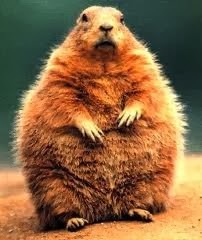 This is a very fat groundhog. What bugs me, is that the people in Pennsylvania have named their groundhog, Punxsutawney Phil, as the official weather predictor. He saw his shadow because, apparently, Pennsylvania had a sunny day on Feb. 2. So Pennsylvania is going to get six more weeks of winter. But I say that Pennsylvania is a different area of the country and Punxsutawney Phil does not speak for the rest of us! Yes, Pennsylvania is just east of us, but, here in Ohio, we had rain all day. No groundhogs saw their shadows in Columbus. I am counting on an early spring. I am begging for an early spring. As I type this, I'm watching the weather forecast for ice accumulation starting tomorrow followed by several inches of snow by Wednesday morning. I like to think that in France, people are not obsessing about the Super Bowl like they are here in the United States. 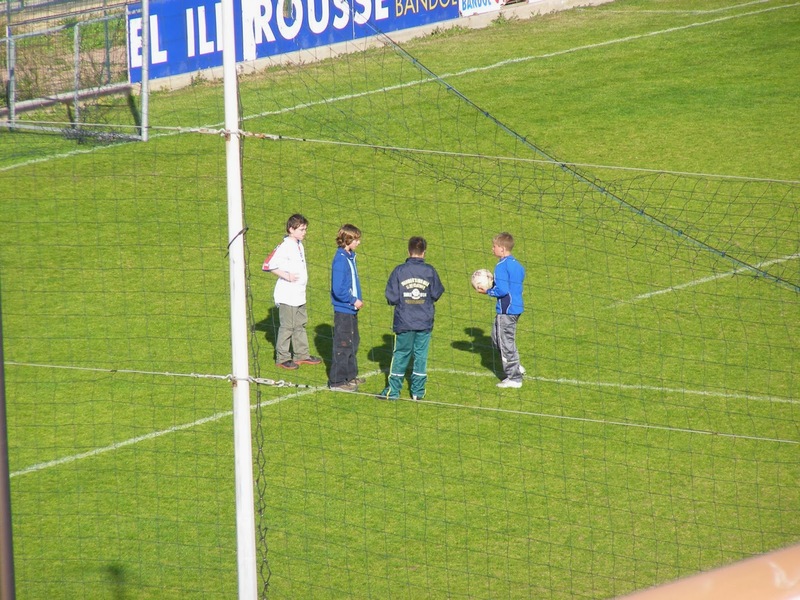 But, in honor of the Super Bowl, here's a photo of French football. 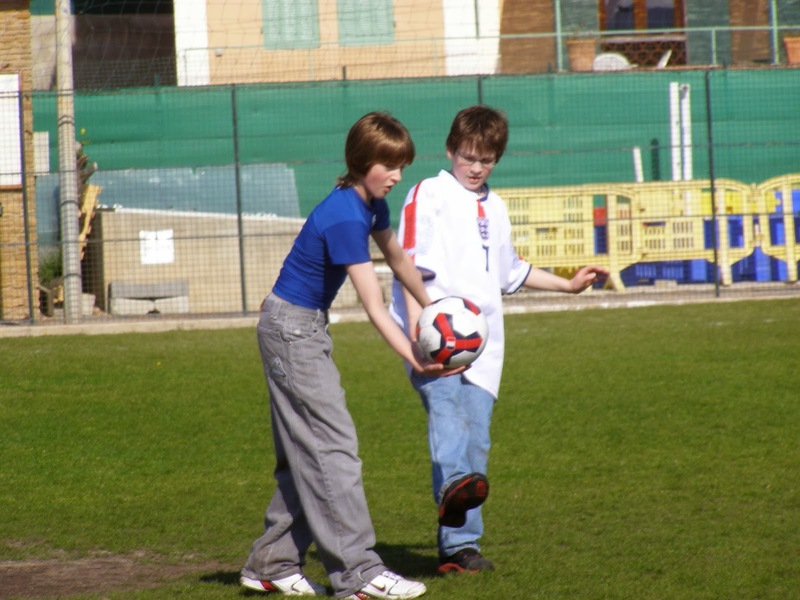 My boys playing soccer on the soccer field outside of our hotel in Bandol. They were 12 and 10 years old at the time. Bandol is along the Mediterranean and this soccer field was just along the coast. Later they met some local boys who played a game of soccer with them. Spencer said the kids talked kind of funny, but they were able to work out the basics through the language of football. This was a great experience for them. Last week I posted some pictures showing how Tucker has changed through his swim years. 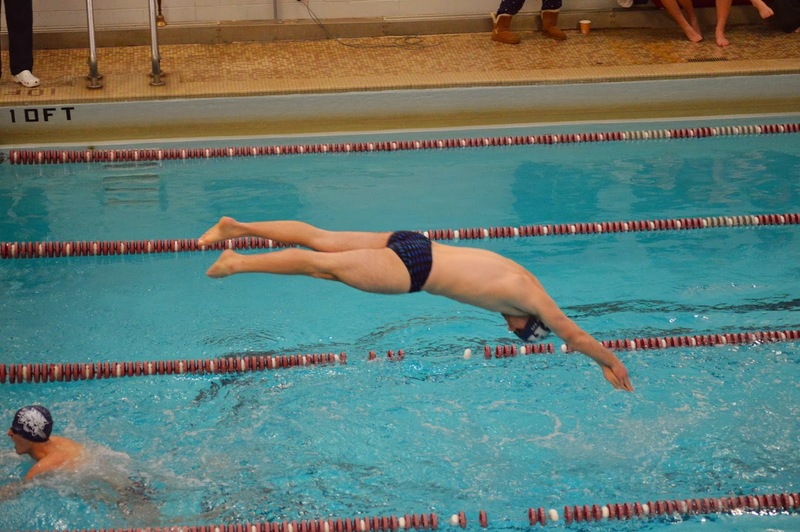 While the post was up, I was at another swim meet, and one of the mothers there had a camera and took some terrific pictures. These have been on Facebook already, but I thought I'd share on my blog. 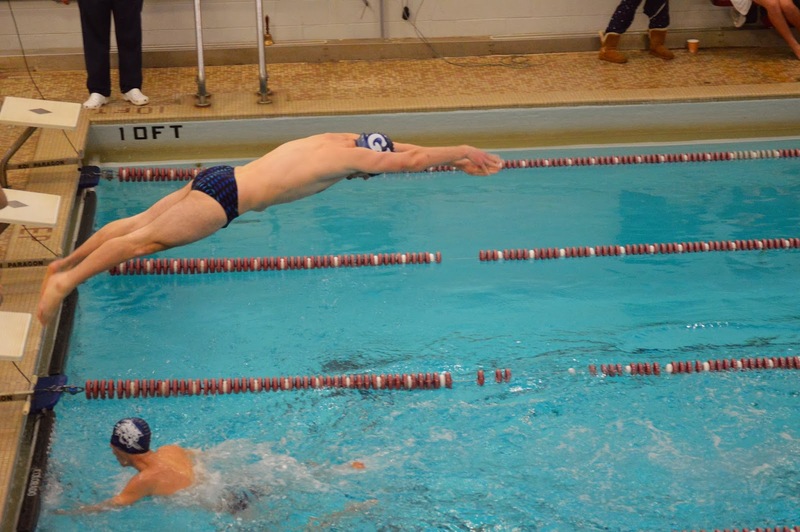 That's Tucker diving in over the head of his teammate during the 400 Free Relay race. The boys won that race. And this is the next frame as Tucker went into the water. I'm off to another swim meet today. Three more weeks if they make it to states again this year.